Top Chef Masters: "Blinded Me With Science"
Back when the season began, I noted that we could be suffering from Top Chef fatigue given how consistently the franchise had aired over the course of the previous year. 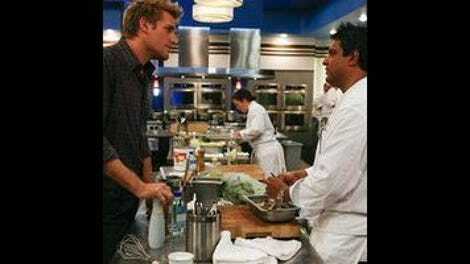 However, Top Chef Masters has created an entirely different scenario: Top Chef Forgetfulness. After last weeks (pointless) hiatus, the show completely fell out of my memory. I wouldn’t say that I outright forgot about it, as I organized my schedule around watching and reviewing it, but I found that I didn’t retain details: it would have taken me a while to tell you the last challenge, or name the remaining competitors, if not for the natural rhythms of “Previously On” features. The week off was definitive proof that this season lacks what is really most important at this stage of Top Chef: Momentum. While the early parts of “Blinded Me with Science” set up a friendly rivalry between Traci and Mary Sue, and a bit more of a jealous rivalry between Floyd and Mary Sue, there just haven’t been any stories building throughout the season. This is simply not a show built around competition, which is why the attempt to make it a show about competition seems so very strange. Each episode can work as a standalone unit, but things are not going to get tremendously more tense or exciting as the season comes to a close. While the previous format had a change of gear built into it, with the winners in the first rounds making their way into the elimination-style second round, this is just the same thing every week, just with fewer chefs. “Blinded Me with Science” is not particularly worse than any of the other episodes this season, but it shouldn’t be this boring at this stage in the competition. There was just no energy here, no spark to make these pretty basic episode structures any more interesting. Was there still some interesting food here? Absolutely — Mary Sue’s idea of mixing Dulce de Leche into churros in the science-themed Elimination Challenge was apparently as delicious as it sounds, while you have to give the chefs some credit for pushing their microwave dishes in the "10-Minute Microwave Breakfast Quirefire" outside of the box a little bit. If the point of Top Chef is to see talented chefs cooking great food, I’d argue that there was at least some evidence of that here. Of course, the show has always been about more than that, and this is especially (and perhaps problematically) the case with this season of Top Chef Masters. It seems that, since they obviously have no actual drama to mine within each episode, they’ve beefed up the “Concept” challenges to the point where this was part science lesson and part cookery. I actually quite like the idea that the chefs should be graded on how they chose to tackle their scientific principle within their dish, and agree with the judges that Hugh and Traci’s basic interpretation of the dishes was a bit of a copout (especially since they chose first and second, and likely chose knowing they were planning on cooking the most obvious options). But the fact that they had to demonstrate for the students, and cook while doing it, just made it all seem like a big spectacle without any clear sense of focus. I’ve spent a lot of time this season discussing how it’s hard to surmise what the critics are basing their decisions on: here, Hugh’s dish went over poorly in its basic conception, and his altercation with James over whether or not his mayonnaise was broken was likely a sticking point, so I don’t think that’s a huge issue. But I sort of wonder if we can’t apply the same principle to the show itself: why did they design the challenge this way? The Elimination Challenge seemed wildly over-produced, and I kept wishing we could just focus on a single element of the challenge. There was some real potential for more interaction with their scientists turned sous chefs, especially the inevitable Hugh & Augustine sitcom Bravo hopefully has in development, but there was also the high school students, the cooking issues relating to the unorthodox equipment (which seemed to affect Mary Sue and Floyd the most, which is odd given they were the top two), and then the actual food itself. By the end of it, I had no idea where my attention was supposed to be, and given my general state of mind with the show it just sort of wandered. In fact, there was a point between the end of the elimination challenge and critics’ table where my mind couldn’t help but wander given that there was a seven-minute commercial break. Now, they technically included a brief little 30-second clip like they always do, but the break was interminably long, and sucked any momentum that the show had even potentially gained within this single episode. By the time they returned, I didn’t particularly care who won, and I didn’t particularly care who lost either. Am I disappointed to see Hugh go given the fact that his quips have been one of the only things keeping me truly engaged as the series has gone on? Absolutely. But the fact that I still could only sort of shrug my shoulders says something about how the show has failed to build meaningful relationships between the chefs and the viewers despite that being the only sound logic behind this new format. Now that I think about it, momentum is sort of a scientific principle, isn’t it? And if we were to use television shows to demonstrate it, I’d argue that reality competition programming is a perfect example. It’s always building towards the finale, always driving the viewer to a final showdown between the remaining competitors. But, why does Top Chef Masters need to have momentum? I would honestly find this show more fun if it didn’t bother with serialization and just had six different chefs cooking for charity each week and tackling some interesting and fun challenges. In that setting, the educational element might not have seemed as out of place, and the show might have had time to really show off the strengths of the challenge instead of making it seem as muddled as Naomi’s explanation of elasticity. There are still great chefs remaining in this competition, and when we get down to the finals in three weeks I think there’s going to be some great food on display. I also genuinely like these people, and find their general affection for one another - like Mary Sue letting Floyd buy some meat on her dime, and Hugh pitching in to help get it to the checkout in time - to be quite endearing. But it’s all drowned out by the show around them, and it’s apparent with every bizarre “Previously On” sequence that pretends the previous episode was a drama-filled affair filled with personal conflict. 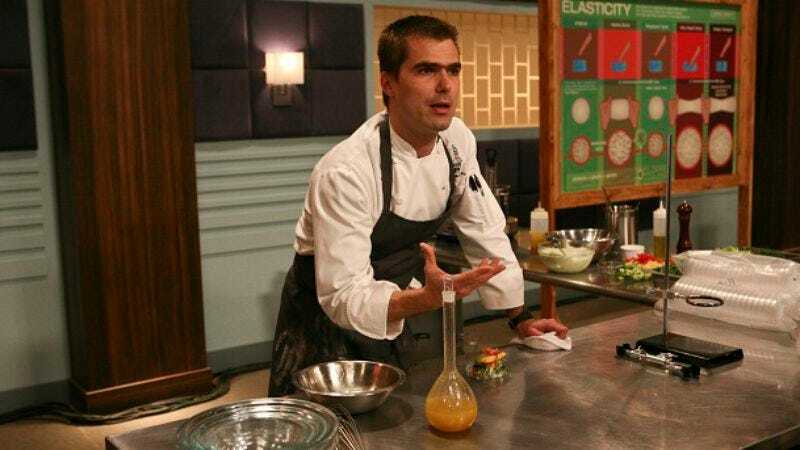 And if you’ll excuse one more hackneyed science metaphor, it’s becoming clear that this season of Top Chef Masters demonstrates a failure of emulsification more than the elasticity of this particular format. I think the grade here is more about lingering frustration than the episode itself: the science idea is interesting and provided some "different" story elements, which they deserve some credit for. Unfortunately, the show is just not in a great place considering how close we are to the finale, so it didn't land as it might have earlier in the season (or in a better season). I love (read: hate) how Floyd’s reaction to a terrible joke about cooking bacon naked was to make an even worse joke about a meat grinder. Curtis was relieving some tension in an awkward moment with two generally unfunny comediennes; Floyd was just trying too hard. I feel sort of bad for Traci: she comes up with this high concept microwave breakfast (her Oeuf en Cocotte) which goes over poorly with the comedians, and then she does a simple dish for the Elimination Challenge and gets beaten up for it. I don’t think the judges were wrong in the latter instance, but it’s not like she isn’t capable: it’s just tough to avoid adjusting on the fly when the challenges are so inconsistent in terms of what will be valued most, especially when you don't know who's judging the quickfires. I actually did sort of learn something from the science lessons — I certainly had no idea that the browning of meat was called the Maillard Reaction. That being said, some of the others were a bit more common sense: you mean different liquids have different consistencies?! I never noticed! “I don’t even own a microwave” is the chef’s equivalent of “I don’t even own a television,” isn’t it? I love how the editors are trying to make the “Coming Up” sequences more dramatic by changing what people actually say: Mary Sue claimed that the science challenge was “ludicrous” in the preview, but then she said it was “practically ludicrous” in the actual quote. Not entirely different, no, but the first sounds almost angry, while the latter is more explanatory. I also love how they had the chefs pick who would go next, as though it might reveal secret alliances, but then they just all went to the person to their right. They just weren’t having any of the Elves’ tricks, were they? I sort of imagine them chatting behind the scenes talking about how they're going to undermine their authority by refusing to take part in their charade except where necessary. And yes, I've been reading the Hunger Games trilogy. And very much enjoyed a similar vibe in Bravo's Work of Art. I will never hear “Calzone” without thinking about Ben Wyatt.